Today we have Marie Plette, a full-lyric soprano, joining us. Ms. Plette has been involved with all three productions of our current Ring and comes back this summer to take on the roles of Freia in Rheingold, Ortlinde in Walkure, and Gutrune in Gotterdammerung. SG: What is it like coming back and working on this project for the third time? MP: It's much more relaxed and very comfortable. This production is really Stephen's jorney and we do our best to realize that vision. SG: Since this is your third time in this production how do you keep it new and interesting each time? MP: It's a lot of fun to re-visit these parts every 4 years. This is the third different production I've been in of The Ring and it's by far the most beautiful one. I was in the Otto Schenk production at the Met and that was just amazing. Seeing all the turntables and lifts working to making everything happen on stage was incredible. I was also in Tim Albery's Ring in Scotland, which was a concept production on a much smaller scale than either the Met or Seattle's, but was still very effective. The thing about Seattle's is it can't be beat for sheer beauty and honesty. It looks like they've taken a northwest forest and put it on stage and I think it's very true to the original intentions of Wagner for the piece. SG: Which of the three characters do you most enjoy playing? MP: Well all three are great. Ortlinde is just a lot of fun and it's easy for me. Friea is the most heartbreaking. 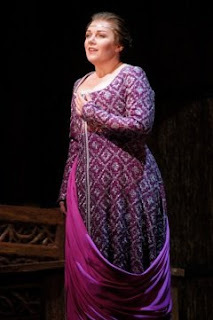 Her interactions with Fasolt are pivotal to the plot in Rheingold. Gutrune is probably the hardest it sits so low. She is stuck in a man's world and is Hagen's pawn throughout the opera. SG: With three very different roles in the shows what does a typical day of rehearsal look like for you? Is it a challenge to switch between these characters? MP: Not only do I have the three roles, but I'm also doing some cover work. The other day Margaret Jane Wray was out and I was playing Sieglinde with Stuart Skelton in Walkure. It was the love scene on the ridge, and it is tricky because you want to inject your own personality, but to be fair to the other performers you want to recreate what it's going to be like when Margaret Jane comes back so that you don't throw them off. It can to a challenge to remember what show you're working on at any given moment. The set of Rheingold is the trickiest to work on, it's got such a huge rake and I have to run around on it and get manhandled by the giants and it's very tiring physically. SG: Is there anything you do to prepare to sing Wagner? MP: Since I'm a full-lyric soprano, or a spinto, I don't do a whole lot of Wagner. I have to convince myself that my voice is just fine in these roles because if I try to out sing everyone else it's not going to work. One the biggest challenges is to maintain my confidence as a singer since I don't have a true Wagnerian voice. Luckily my voice can usually go over the top of the bigger Wagnerian voices. But the main reason I keep coming back is The Ring is one of my absolute favorite things, that and I get to wear Marty's [Martin Pakledinaz, Costume Designer] dresses. Marie would love doing Ortlinde in Anthony Pilavachi's "Walkuere"-staging in Luebeck, where the third act is set as a Friday night at the bar in an AirForce "O"-club, and it all fits the teaxt and the music!! If you have ever been in a USAF "O" clbub on a Friday night, you'll recognize not only Wagner's "Ring", but your own memories! It also works when Bruennhilde's CO chews her out for not following orders.